There's a New Final Fantasy Coming. It's a Typing Game. For their next Final Fantasy game, Square Enix is adding a bit, or a whole lot of word play. Revealed in Weekly Famitsu, coming next week to iOS and Android platforms is Final Fantasy World Wide Words. The game uses the chibi-style character designs from the Theatrhythm series for an RPG that progresses through typing words. Players start out by assembling their party from a roster of familiar Final Fantasy characters. They then proceed through various worlds by battling monsters using various abilities and summons that are activated by typing words that appear on the screen. Each world consists of multiple stages with a final boss to defeat. The game also has customization elements as well as a chocobo farm where you can gain special customized words and money. Images released only show the Japanese version of the game, so I have no idea what the text usage is like in other languages. Much like the previously announced stand-alone Final Fantasy VII bike chase game, G-Bike, the game will be free to play with paid elements, because all the cool kids are doing it. 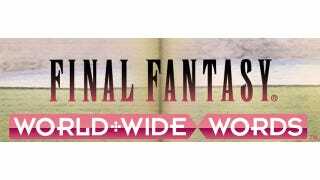 Final Fantasy World Wide Words is scheduled for release on iOS and Android platforms on September 16th.